Starting a medical marijuana dispensary is an expensive endeavor. Pot entrepreneurs must shell out a small fortune for everything from grow equipment and security systems to MMJ registration fees and building modifications. The costs can multiply quickly once the business is up and running, particularly if an upgrade or expansion is on the horizon. So where do medical marijuana dispensary owners turn when they need some financial help? As we’ve reported numerous times, most financial institutions give pot businesses the cold shoulder, fearing the repercussions of working with a company that sells marijuana. As a result, many dispensary owners and entrepreneurs turn to friends and family members for financing. Raising money from the in-laws or a best friend is in fact a great way to fund a medical marijuana business. But there are many pitfalls along the way, and MMJ professionals rush into such deals only to regret them later. This is where Medical Marijuana Business Daily comes in. We have just released a business toolkit that walks dispensary owners through the process of landing financing, from pitching a family member to drafting a prospectus (don’t worry, we explains what this means). 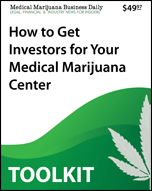 The toolkit – titled “How to Get Investors for Your Medical Marijuana Center” – includes checklists, sample forms and cost worksheets, all in an easily digestible, easy-to-understand format. The financing toolkit is now on sale in our new online store, where you can also check out our other reports for the MMJ industry. Our goal is to help medical marijuana business owners thrive, which in turn will strengthen the entire MMJ market for everyone involved. This is a great article, what about a toolkit for investors to find dispensaries or start-ups? I am sure there are hundreds of MMJ entrepreneurs looking for funding. Geo, you can contact me.